We don't need much convincing to watch another anthology from the V/H/S team as they reinvigorated the format with the generally stellar first two films - the less said about V/H/S: Viral the better. 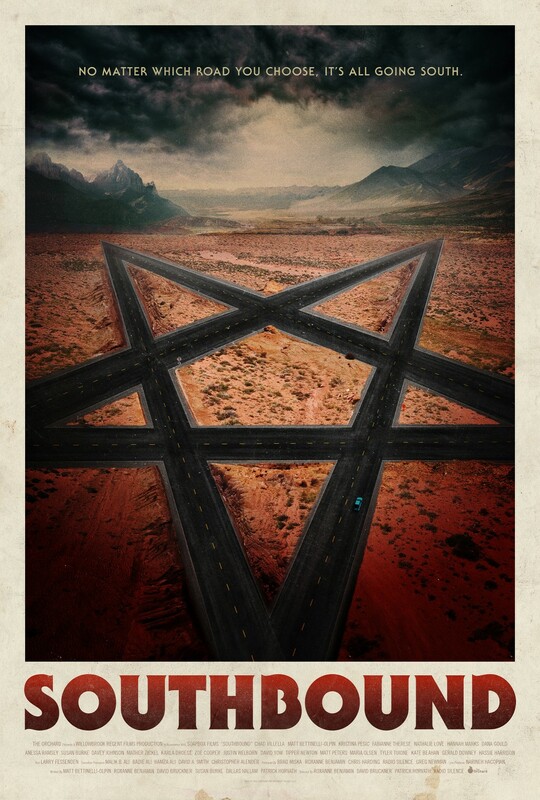 On a desolate stretch of desert highway, weary travellers—two men on the run from their past, a band on their way to the next gig, a man struggling to get home, a brother in search of his long-lost sister and a family on vacation—are forced to confront their worst fears and darkest secrets in these interwoven tales of terror and remorse on the open road. Despite the increasing patchiness in recent anthology films, they maintain a continued appeal given the range of talent that they attract. Even V/H/S: Viral had some great moments thanks to Nacho Vigalondo and Justin Benson. Southbound hits VOD February 9th. Check out the cool poster after the trailer.